It seems a shame to have only one element in a photograph, here is one photograph with a multitude of elements to even things out. Out of 8 photographers, there is one P&S camera and one DSLR. Why is the smallest photographer the one with the biggest camera? Why is the point and shoot photographer using one hand to hold his sunglasses up when they are on a cord around his neck? 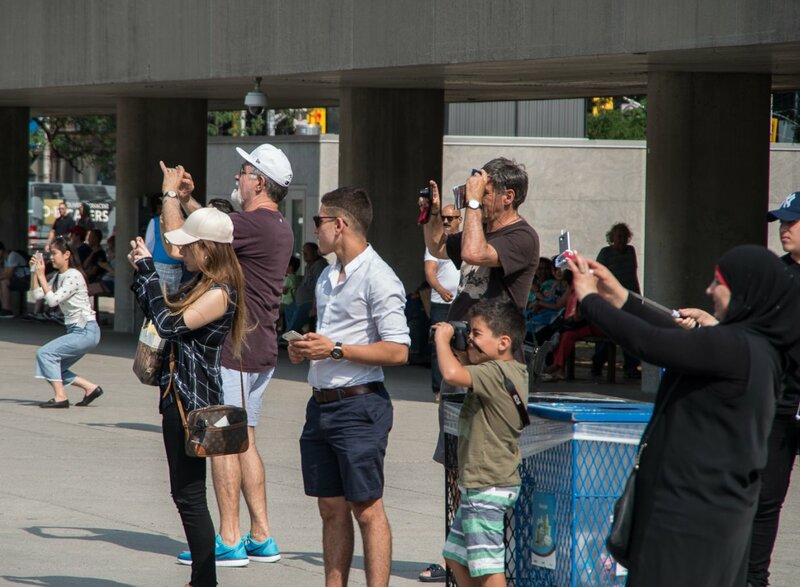 Why is the selfie stick photographer not smiling and why isn't he putting the fountains in front of Toronto City Hall in his picture like everyone else? (or is he not taking a selfie?) So many questions and no answers. Before I even read your text, I'd already noticed the young lad with the biggest camera, and the range of cameras used by everyone else. And I immediately wondered what was so interesting that everyone was so desperate to take a photo. The kid must be thinking... " What's up with all those freaks with their phones"
what was so interesting that everyone was so desperate to take a photo. 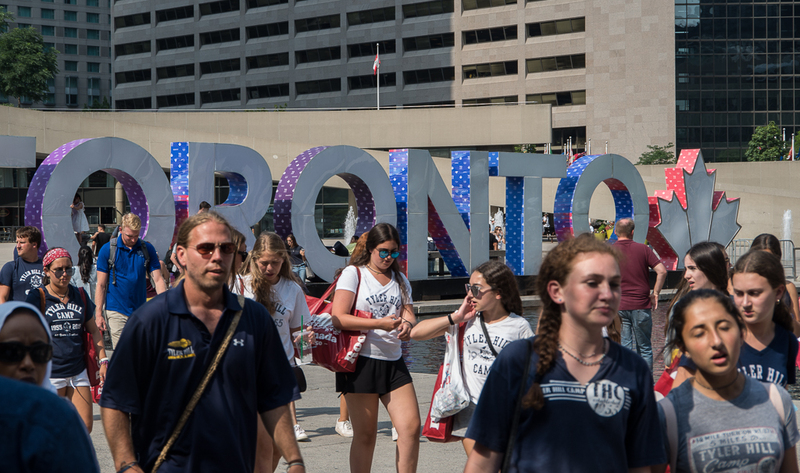 There were so many stinking tourists on the plaza in front of Toronto City Hall that I couldn't get the fountains in the picture at all. Not even ND filters or composite shooting could pull it off and I wasn't about to start waving a gun around to clear the area (being Toronto, I would end up being shot by a dozen gang members with unregistered guns). Or maybe "I can't wait to be old enough to have a phone too". These fountains must put on quite a display... to gain this much interest. This is the sort of image I always look for, but seldom find, great capture. I thought it ironic that its the youngest photographer who's the only one using a viewfinder!